Four employees died while working on a transmission tower. A Hydro One helicopter can be seen at the crash site near Tweed, Ont., on Dec. 14, 2017. Best friends, soulmates, fiancees and boyfriends: that's how friends and family are remembering some of the four Ontario utility workers who were killed in a helicopter crash in eastern Ontario on Thursday. 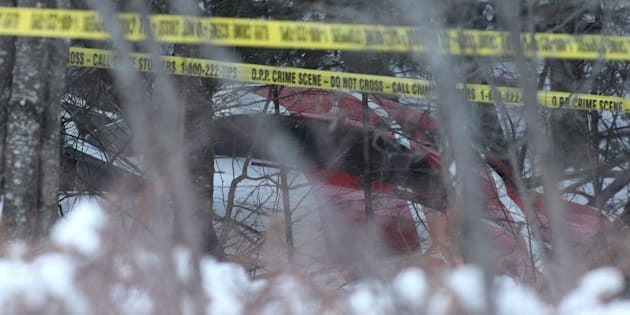 The men, identified by Hydro One on Saturday as 39-year-old James Barager, 27-year-old Kyle Shorrock, and Jeff Howes and Darcy Jansen, both 26, were working on a transmission tower in Tweed, Ont., and crashed when the chopper was approaching to land. Jansen's mother, Brenda Jansen, said her son — a line technician from Long Sault, Ont. — was an outdoorsy person and an avid guitar player. "Anyone that knew him just loved him, he was a really lovable kid," said Brenda, adding that he had just bought a house last year and moved in with his girlfriend. "We're going to miss him, he's going to be really missed. He touched a lot of hearts," she added. She said the small community in Long Sault came together to support the family over the weekend. Friends of Howes, who was from Bath, Ont., and was a line technician with Hydro One since August 2013, took to Facebook to remember him as someone "who always had a smile on his face" with a contagious laugh to match. Shorrock, of Inverary, Ont., was also a line technician and was engaged to be married according to his Facebook page. "Yesterday I lost my best friend, my everything, my soul mate, the person who made my world go round," wrote Brittany Robertson, who said on Facebook that she was Shorrock's fiancee. Hydro One said Barager, the pilot, had been with the company since 2009 and was from the Orillia, Ont., area. Yesterday I lost my best friend, my everything, my soul mate, the person who made my world go round. The company held candlelight vigils at its offices across the province Friday morning and said most ground crews would be standing down from their jobs until Monday. Workers will still respond to any reports of power outages, it said. "It is a time of emotion and shock for all of us at the company," said the company's CEO, Mayo Schmidt. The Transportation Safety Board said Friday that it had obtained initial statements from the crash, but still must examine maintenance records, pilot training and several other factors. The helicopter did not have a cockpit voice recorder or a flight data recorder, but the TSB said it recovered a GPS, which will help in the investigation. The agency said investigators would be looking at a wide range of factors to determine a possible cause of the crash, including pilot records, aircraft maintenance records and aircraft history. The single-engine AS350 is a utility helicopter often used for corporate purposes and by police.